3 lb Ultralight Day Hiking Gear Checklist – stay safe, be light, have fun! Day hiking is supposed to be fun. And part of the fun is a light pack for easy walking. Unfortunately, most day hiking gear lists are way too heavy. But on the other hand, you DO want all the right gear to be safe! So what to do? This ultralight day hiking checklist will help you select the right gear to keep your daypack light, a spring in your step, but still keep you safe and happy. Better yet, it has a lot of inexpensive gear so you won’t go broke in the process! Most lists don’t have weights for their gear. This inevitably leads to a heavy pack. They don’t give specific options for light gear or budget gear. E.g. the 10 oz! $40 REI Flash 18 Pack or the value $40 Carbon Fiber Trekking Poles (on Amazon — 1/3 price but equal to the best poles! They are too focused on the 10 essentials and fail to recommend important items like packs, trekking poles; light, non-blistering hiking shoes; best strategies for Lyme & Zika protection, etc. Photography: Finally, a major focus of many day hikes is getting great photos. We have a great post on The best lightweight Camera Gear for Hiking which includes a bunch of photo tips and hacks. Buckskin Gulch Utah: One of the longest and deepest slot canyons in the world. It’s a fabulous 21 mile, semi-technical canyoneering day hike where a light pack makes a huge difference in having fun! Like most day hiking checklists this is based on a core set of “essentials.” In this case, my popular “13 Essentials for the Modern Hiker —A Realistic 10 Essentials.” (It’s worth a quick read if you haven’t done so.) But my list goes further to give you all the OTHER gear you need to be safe and happy on a long day hike. Note: a Weight Summary Table is at the end of this post. or smaller $28 Flash 18 10.0 10.0 Very light, inexpensive & functional UL packs. Blessedly minimal which is wonderful! Pack opt 2 Osprey Talon 22 M’s & Tempest 20 W’s Daypacks Lots of pockets for fast access & gear org. Non-sweaty backpanel. Pack opt 3 $90 Moutain Laurel Designs Core 22L Pack 6.5-7.5 oz Lightest pack here. Made in USA. Minimal, durable, utilitarian. Your own “day” pack Most small to medium backpacks! e.g. $16 High Sierra Riprap Backpack at Costco (25 oz) Most packs approx. 15 to 30 liters (900 to 1800 in3) should work. I’ve taken my city laptop backpack on daylong technical canyoneering trips! or a trash compactor bag 1.2 Both are lighter less expensive & more effective than a pack cover. Light & low cost daypacks L to R from lightest to heaviest: [Far left – $90 MLD Core 22L Pack (6.5-7.5 oz) Made in USA. It’s the lightest pack. Minimal, durable, utilitarian design. ], $28 REI Co-op Flash 18; $55 REI Co-op Flash 22 Pack; Ultimate Direct. Fastpack (not low cost, but efficient & full of pockets ), $16 High Sierra Riprap from Costco, the least expensive but heaviest. Alt. 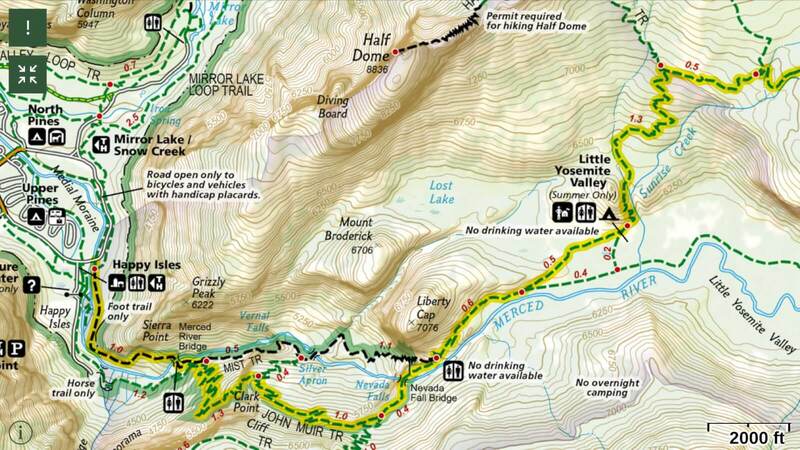 navigation GPS App on Smartphone (~6 oz) See “13 Essentials for Modern Hiker” for more info. on GPS navigation and mapping via smartphone. Standard water bottles, e.g. Aquafina, work great. Purification Sawyer filter (3.0) 3.0 To drink on the spot – greatly reduces water cary/weight. Non chemical. Purification Chlorine Dioxide tablets (0.5) Light purification alternative. Filter backup. 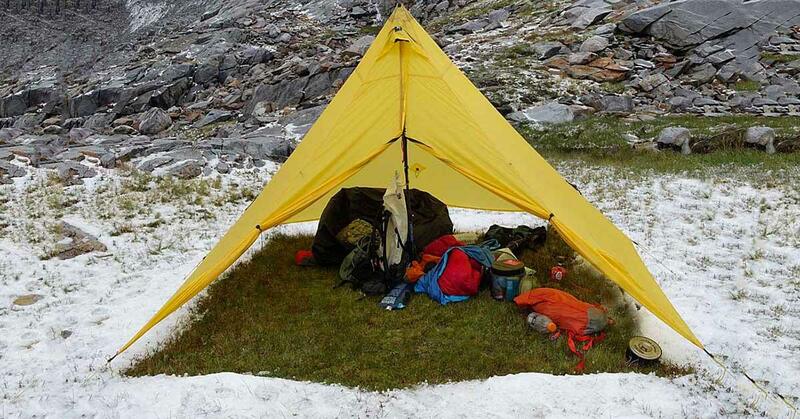 Shelter Emergency bivy 3.8 Prefer bivy over blanket. Can also take a light tarp. or Patagonia R1 Pullover Think of it as “fur for humans.” possibly the most versatile cool to very cold weather base layer. It works over an astonishing range of conditions. or Feathered Friends Eos (10.5 oz) For colder hikes, and especially at rest stops. Stuffed with 900 fill power down! GiooValue wm jkt $24 “32 Degrees” Down Vest 6.0 “32 Degrees brand” Packable Down Vest @Amazon. Warm hat OR Option Balaclava 1.2 Warmer than hat. Or a fleece beanie. Gloves (basic) Defeet DuraGloves (2.5) Great liner glove – light, warm, durable! Good clothing is critical when the weather turns to crap! Rain Jacket (Value) REI Co-op Rainier Rain Jacket $45-$90 value rain jacket with a solid and functional design. RainJacket (alt) Patagonia Storm Racer (6.0) Light! Minimal. Amazing it’s 3-layer fabric! Rain Pants OR Helium Rain Pants (6.0) Light, inexpensive. Don’t bring on many hikes. MLD eVENT Rain Mitts (1.2) Light. Waterproof. Add a lot of warmth over gloves. Underwear ExOfficio Give-N-Go M’s & W’s 2.0 Dry fast, don’t hold a lot of moisture. Shoes Altra Lone Peak Trail Runners 18.0 Light. Huge toe room. Comfortable! Superiors lighter. Lone Peaks more protective sole. Darn Tough 1/4 UL w cushion 1.8 All are great socks. For most hikers, the thinner & less padding the better. Watch value $35 basic solar wrist watch 1.5 My favorite basic watch for hiking. Watch Suunto Core w positive display 2.2 Compass, altimeter, multifunctional timepiece. Hiking clothes Sun & bug protective clothing is your first and best option… See clothing section above for best hiking shirt, pants, hats, trail shoes, etc. 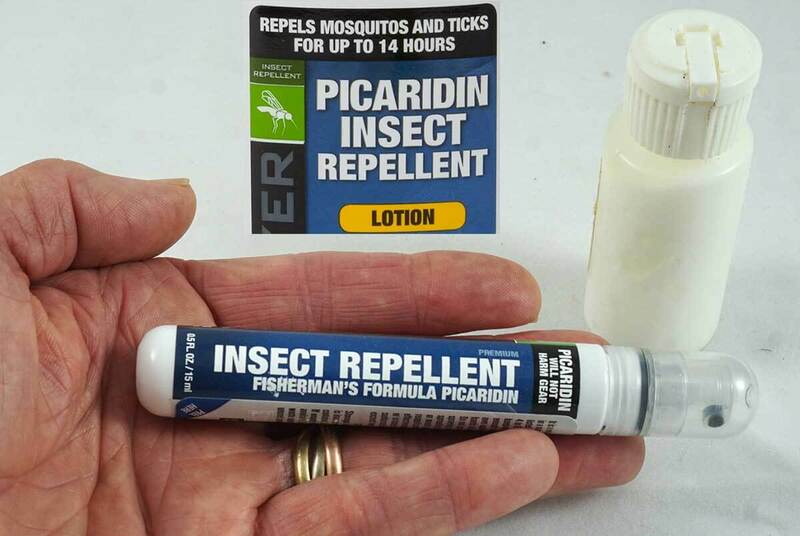 Pocketable Picaridin 0.5 oz spray 1.0 Lyme Zika protection: Picaradin Lotion most effective & long lasting. Unlike DEET it has no odor & won’t melt plastic. Sunscreen Small 1 oz tube 1.0 Or repackage your favorite into a 0.5 or 1.0 oz bottle. Best if applied before you go hiking. Best Lyme & Zika protection: Picaridin (lotion) lasts 40% longer than most DEET products and lacks the downsides of DEET. It has no odor and doesn’t melt plastics or degrade clothing. In Hand: Airline friendly 0.5 pump sprays, last 8 hours are small, pocketable and easily applied in the field. Right rear: Picaridin lotion lasts 14 hours, and can be repackaged into small 1 oz squeeze bottles. Toilet paper Plain, white, non-perfumed Use sparingly. See LNT practices. Right: The 0.6 oz Deuce of Spades Potty Trowel, minimal TP, and small bottle of Purell allow for good LNT Waste Disposal for around an ounce. Left: “Wag bag” for when regulations require you carry everything out. Bring a change of clean clothes, sandals for tired feet, water, & a snack in the car for post hike. Read more on clothing and repellent suggestions for Best Ways to Protect yourself from Lyme & Zika and other bug transmitted diseases. Practicing Leave No Trace Principals: e.g. proper tools & techniques for waste disposal; using light, low profile tread shoes for minimal impact, etc. Clothing Worn and Items Carried (not in pack) 3.8 Includes hiking shirt & pants, hat, shoes, trekking poles, stuff in pockets, etc. https://i1.wp.com/www.adventurealan.com/wp-content/uploads/2017/08/day-hiking-lead-photo-beach.jpg?fit=1200%2C628 628 1200 Alan Dixon http://www.adventurealan.com/wp-content/uploads/2018/03/adventure-alan-lightweight-backpacking-hiking.png Alan Dixon2018-03-22 12:01:272019-04-24 11:37:243 lb Ultralight Day Hiking Gear Checklist - stay safe, be light, have fun!